Before spring blooms come to an end, here’s a look at some of the flowering plants in my perennial garden. 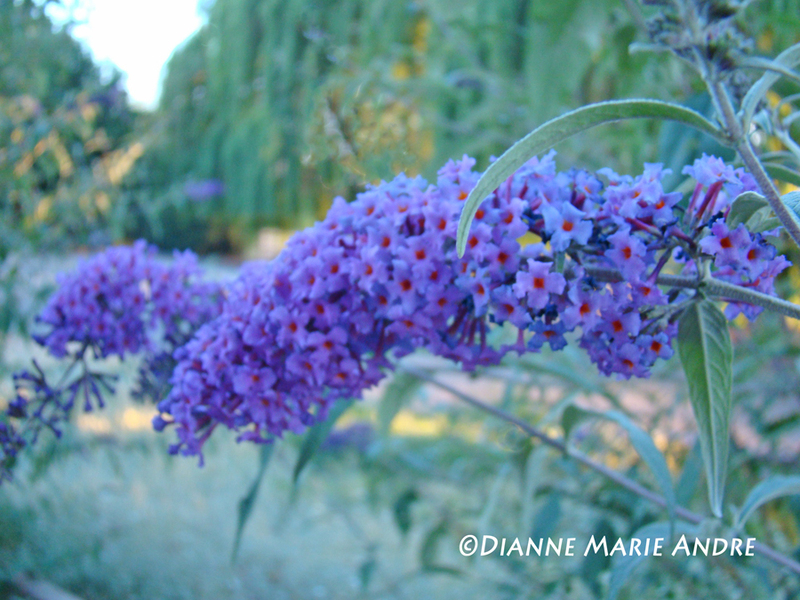 First up is Buddleia, a whimsical deciduous (or evergreen depending on your zone) shrub or tree. I love these because they attract butterflies and humming birds. I have six Buddleias, three in a row on two sides of the garden. Although they serve as an enclosure, I can see through them because of their wispy-like branches. This Hydrangea was a grocery-store gift from hubby. Last fall, I transplanted it from a container to the garden. 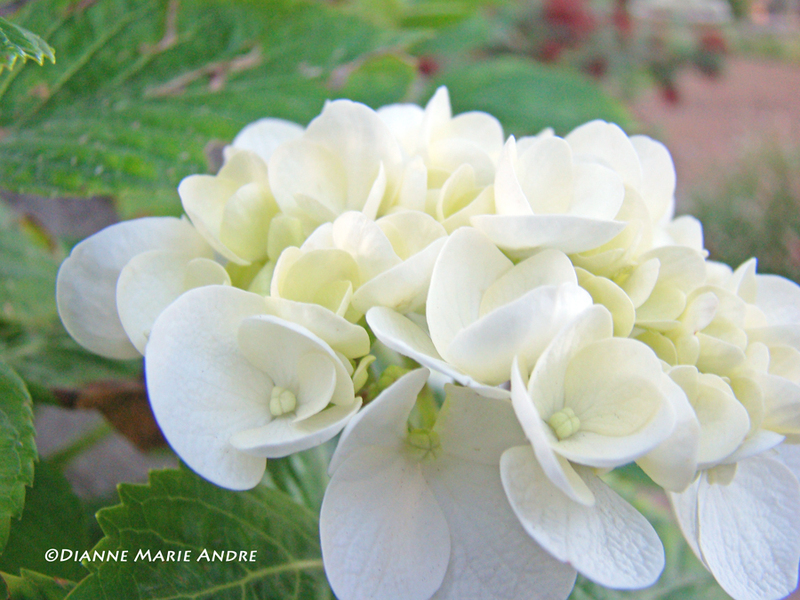 What a wonderful pop of color these white clusters add to the garden. Cosmos . . . and my only blossom. I planted seedlings in three different locations. Snails loved these and quickly devoured the Cosmos in the bed near the front door. No explanation for losing the others. Perhaps the soil is too rich which the Sunset Western Garden Book says to avoid. Aww, red! 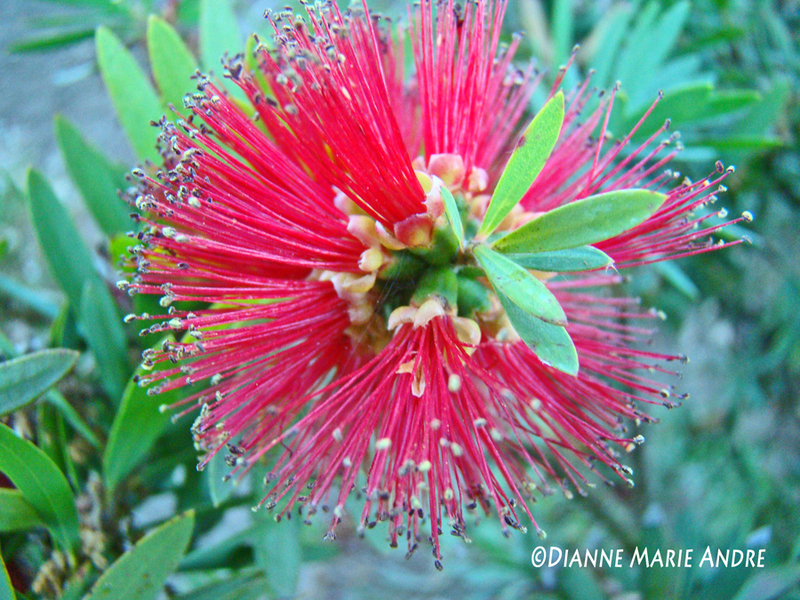 Dwarf Callistemon (bottlebrush). I have to admit there are two things I don’t like about this plant. Even though the leaves are tiny, they shed throughout the year and create quite a mess. Also, the blossoms are not self-cleaning and have to be deadheaded. Spiraea is a small deciduous shrub with beautiful flower clusters that also have to be deadheaded. But I enjoy this plant so much, I don’t mind the work. Mine are fifteen years old and only waist high. So there’s no reaching or climbing a ladder when it is time to trim. 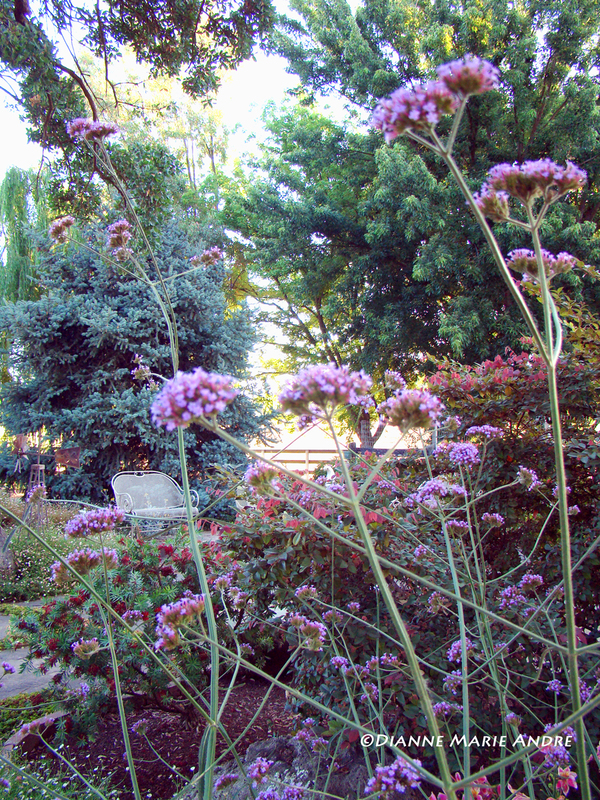 Tall Verbena (Verbena bonariensis) is my favorite perennial. I LOVE the architectural structure. 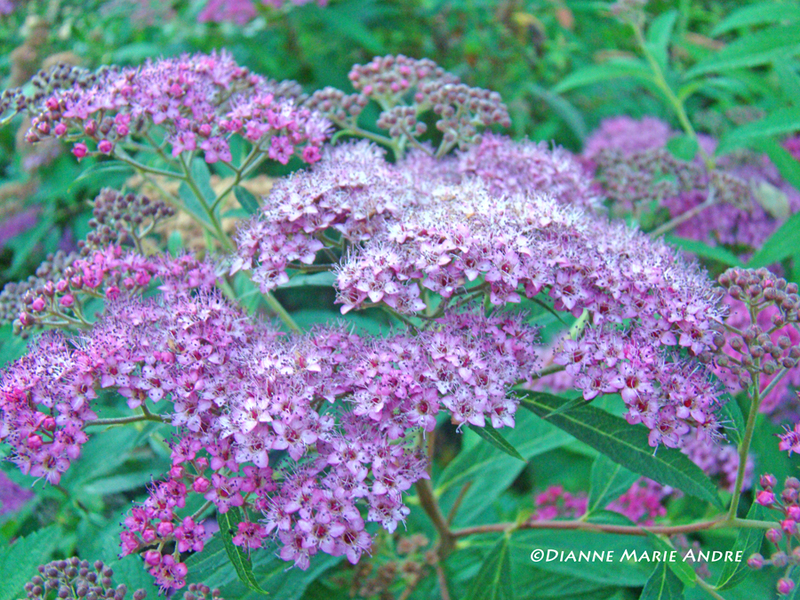 Little purple clusters sit on thin, six-foot tall stems. The view of neighboring plants isn’t blocked! The stems are so strong no staking is needed. 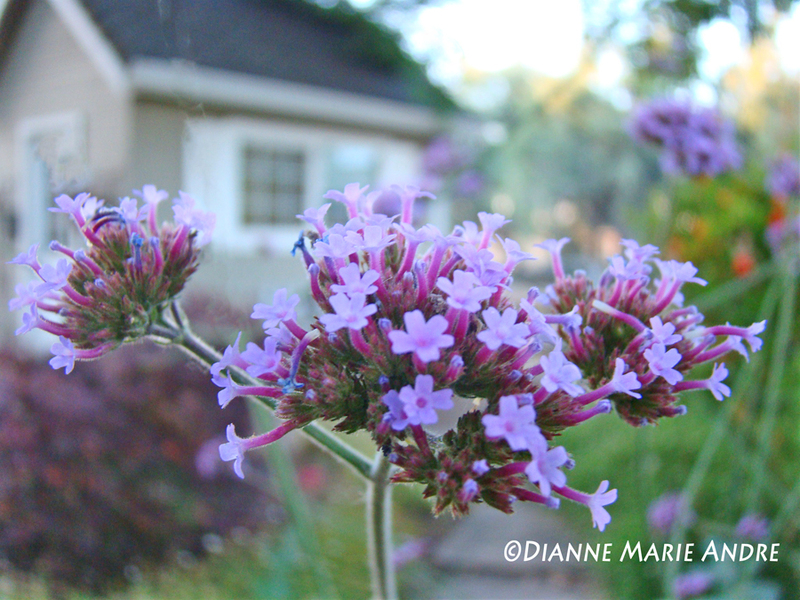 Tall Verbena is difficult to photograph, but in person it is the STAR of the garden. Drought Tolerant. Attracts butterflies. That’s the end of the tour. If you’ve been following me for a while, you know there are other spring-flowering plants in my garden (begonias, variegated iris, Santa Barbara Daisies, saliva, snow in summer, and a few more), but I figured you have probably seen enough of those! 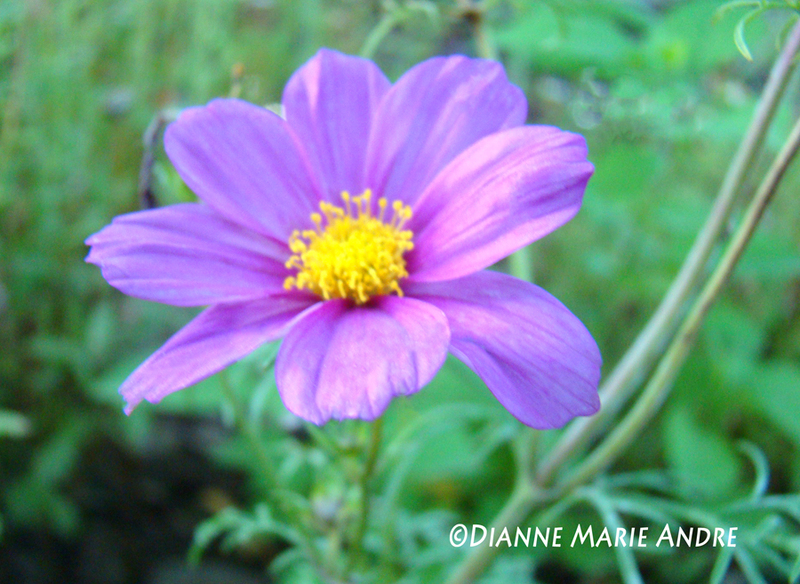 I would love to hear what spring blooms you have photographed and which flowers are you favorite? Oh, I have updated my “About” page. Take a look.